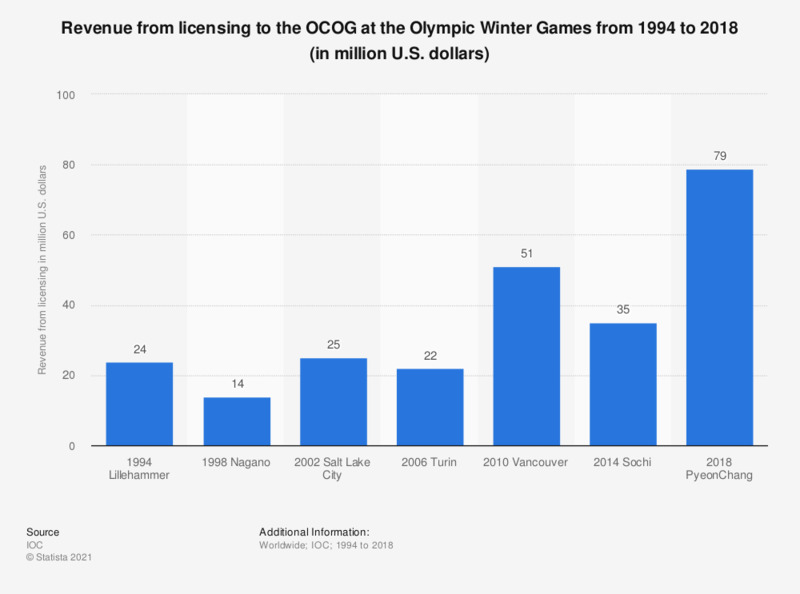 This graph depicts the revenue from licensing to the Organisation Committee for the Olympic Games (OCOG) at the Olympic Winter Games from 1994 to 2014. In 1994, the total revenue from licensing amounted to 24 million U.S. dollars. The Organising Committee for the Olympic Games (OCOGs) organise the Olympic Games. Olympic Movement organisations develop programs to create Olympic Games-related products, merchandise and souvenirs for consumers through licensing agreements that grant the use of Olympic marks, imagery, or themes to third party companies that market and manufacture the products. Olympic Games licensing programs are managed by the OCOGs under the direction of the IOC.